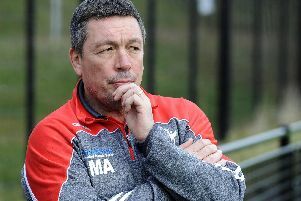 Sheffield Eagles have been hit with a fresh injury blow after director of rugby Mark Aston confirmed half-back Cory Aston faces six to eight weeks on the sidelines. With the Eagles already low on numbers, the loss of the Castleford loanee will come as a bitter blow to the Eagles who are set to face Rochdale Hornets at the Olympic Legacy Park tomorrow afternoon. Aston Jnr picked up the injury after a challenge in last weekend’s defeat at Barrow Raiders, leaving coach Aston frustrated after admitting that the 23-year-old was showing signs of the form that earned him his big move to Super League. “The disappointing thing for him is that he was just getting back to where he wants to be after what was a bit of a rushed start,” Aston told The Star. “We needed him in that form but we have lost him now. “We have just got Simon Brown in to fight with Cory and Oscar Thomas for a position, and now we have lost Cory which is very frustrating. The knee injury sees the ex-Leeds schemer return to Castleford temporarily as the Eagles look to reverse their current run of defeats with an Easter double-header on home soil. Aston Snr has already raised the prospect of bringing the youngster back to his home town club when fit again, and is confident it isn’t the last the Eagles have seen of Aston Jnr. “When he is fit again he will be needing to play so we know that they are quite keen for him to return,” Aston confirmed. The Eagles go into tomorrow’s encounter (3pm) without winger Ben Blackmore who is serving a one-match following an incident against Barrow in the Challenge Cup clash. Aston also expects to still be without centre Menzie Yere and full-back Corey Makelim who are still awaiting clearance to play.